A seminar on citizenship organized by the European Association for the Defense of Human Rights (AEDH) will take place at the EU House in Tallinn on Friday featuring MEP Tatjana Zdanoka from Latvia as one of the speakers. The major Estonian organizations dealing with the topic of human rights have neither been informed about the event nor invited to attend. Marianne Meiorg, head of the program for equal treatment at the Estonian Human Rights Center, and Vootele Hansen, chairman of the Estonian Human Rights Institute, told BNS their organizations had not received any information about the event. According to the AEDH website, about 20 human rights organizations from EU countries will participate in AEDH's annual seminar and general assembly in Tallinn from May 31 to June 2. «The event will open on Friday with the public seminar 'citizenship, citizenships.' AEDH member organizations, academic experts, members of the European Parliament and citizens will discuss and exchange views on crucial aspects of citizenship, including the problem of statelessness, residence-based citizenship as well as social citizenship. The seminar will end with an exchange on best practises of AEDH member organizations,» the webste says. The opening remarks of the seminar will be read by Aleksei Semjonov, director of the Estonian Legal Information Center for Human Rights (LICHR), and Serge Kollwelter, chairman of AEDH. Other speakers will include LICHR's Vadim Polestsuk, Aleksejs Dimitrovs, member of the AEDH executive board and of the Latvian Human Rights Committee, and Dimitry Kochenov, described in the seminar's program as academic expert on citizenship. The three panels of the seminar are titled Lack of Access to Citizenship, Political Citizenship, and Economic and Social Citizenship. In the later panel speakers include Estonian MEP Kristiina Ojuland and Latvian MEP Tatjana Zdanoka. LICHR, the Estonian member of AEDH and co-host of the event, as well as its leader Aleksei Semjonov have been mentioned in several annual reviews of the national security police of Estonia. Semjonov gets mention also in the annual review of the security police for 2009 in connection with an attempt by Russia to put together a list of Russian candidates for the elections to the European Parliament in that year. The annual review says that on Feb. 28, 2009, when Russian compatriots organizations held a meeting in Tallinn, Georgi Muradov, head of the department for foreign relations of the city government of Moscow, began a two-day visit in Estonia. «At the beginning of the visit Muradov claimed in an interview to the Estonian media that he came to Estonia for holiday and to visit a friend. In reality, the trip was spent holding conversations with compatriots summoned to the embassy of the Russian Federation in Tallinn. The purpose was to agree on how to form a joint list of Russian candidates for the elections, with Aleksei Semjonov, an active member of the Coordination Council and the head of the non-profit association Legal Information Center for Human Rights, as the number one candidate,» the annual review said. That Semjonov was picked out was understandable, the security police said, as he is a person engaging with «the subject of human rights from the position of Russia and his activity is being financed from Moscow.» According to the annual report of the Legal Information Centre for Human Rights, financial support from the Embassy of Russian Federation made up nearly half of the total support to their projects in 2008. At the meeting the candidates of the planned joint list were offered an incentive package of more than 10 million kroons if they met the established goals. «How large a sum would have actually arrived in Estonia remains unknown, as they did not manage to form the joint list of candidates and thus the purpose of the incentive disappeared,» the security police said. 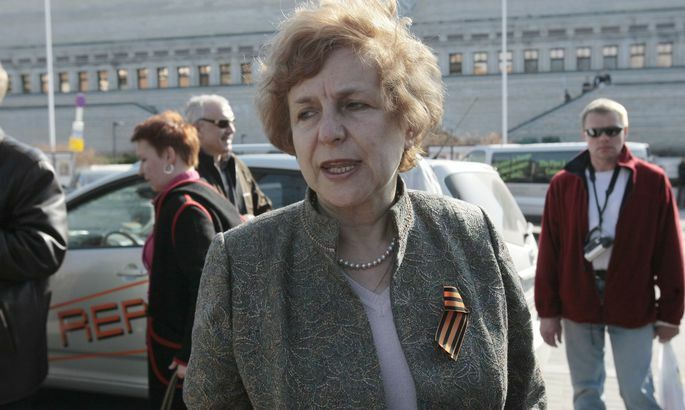 MEP Tatjana Zdanoka, former activist of the Communist Party of Latvia and the Interfront movement against the independence of the Baltic countries, has held a series of events at the European Parliament aimed to demonstrate that the human rights of Russians are being abused in the Baltic countries.